Liz Nielsen was born in Wisconsin in 1975 and lives and works in New York City. She received a M.F.A. in Photography at the University of Illinois at Chicago and a B.F.A from the School of the Art Institute of Chicago. 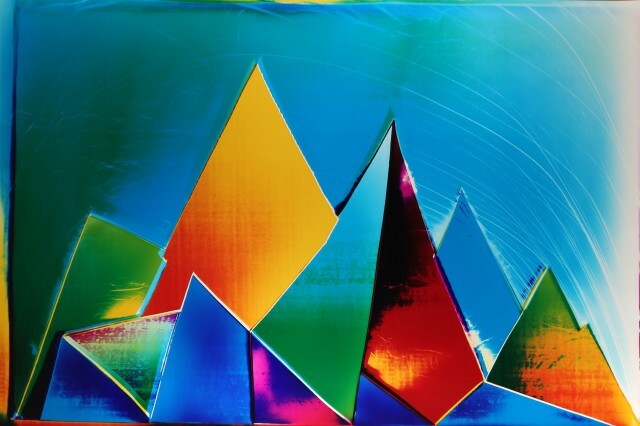 Replacing the traditional negative with hand-cut collages comprised of different coloured gels, Nielsen projects her forms onto chromogenic paper creating colourful, abstract images. The paper she uses is negative rather than positive, thus reversing the colours of the gels, and often creating surprising new combinations. Nielsen’s work has been exhibited extensively in Chicago, New York, and Berlin and has been recently reviewed in the New York Times, Artslant, the Wall Street Journal and the Financial Times.